Well it's been a minute since I've posted a new make, but I have a great excuse! I was traveling, relaxing, and just taking whatever time I needed to complete some new projects. Here I have a jumpsuit that I made about a month ago. 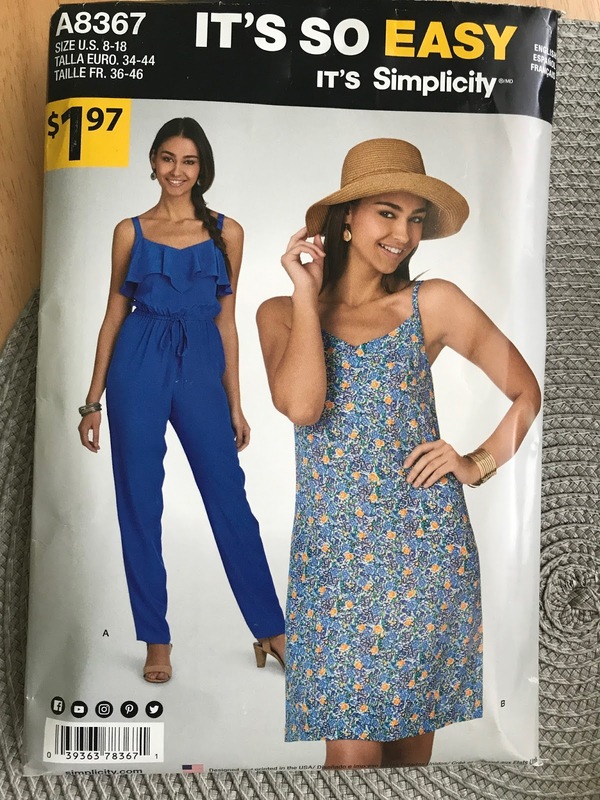 I found this Simplicity "It's So Easy It's Simplicity" pattern at Walmart a couple of months back. 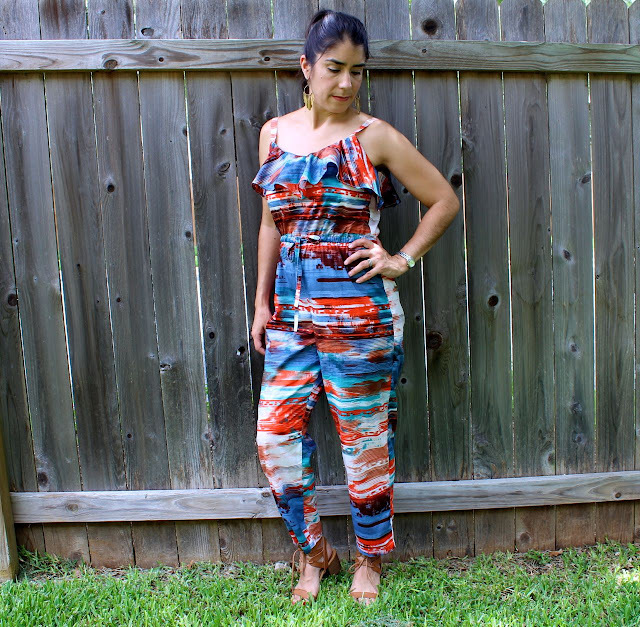 It was a great price and I loved the design of the pant jumpsuit. I had also been wanting to making another one piece since my last one I made about a year ago (see my previous post). 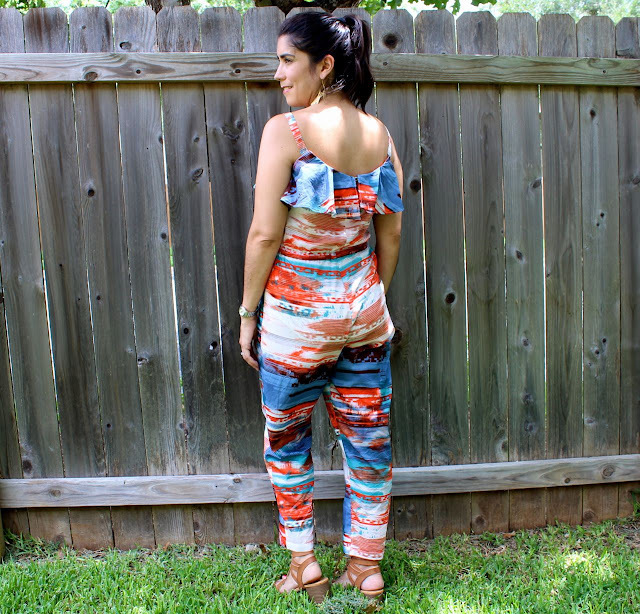 The fabric was purchased at Joann's, I found it along side other ethnic/summery type fabrics. The fabric is a lightweight cotton and has good shape for this garment. I decided to cut size 12. I didn't attempt to grade between two different pattern sizes since there wasn't a finished measurement for the hips. 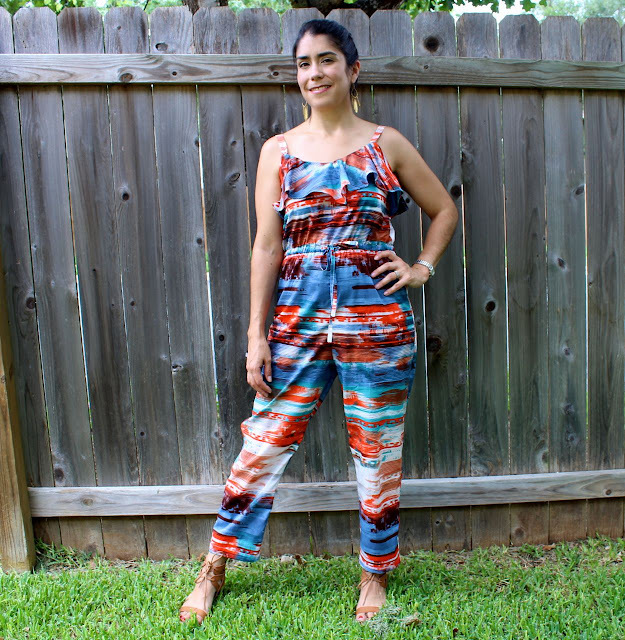 I guess I got lucky because the jumpsuit fits me perfectly. I did take off quite a few inches from the bottom hem because I wanted the pants to hit right above my ankles, which I thought would look nice with sandals. I haven't found this pattern being sold anywhere online so I am posting a picture of the packaging. I think "It's So Easy It's Simplicity" is sold exclusively at Walmart. Now, as to why Simplicity would package this as "easy" is beyond me. For me, as an advanced beginner, the bodice was a bit of a challenge to put together. I had to sew then use my seam ripper about 3 or 4 times to get the shoulder straps right. Other than that the pattern was straight forward. 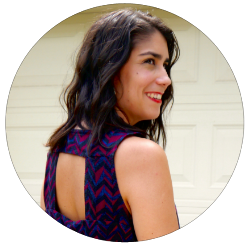 I was surprised (and thankful) how simple it was to sew the bodice and pants together plus creating the button holes in the front where the waist tie would go. Anyway, I finished it but it took me a bit longer than I thought to complete it. I have already worn this out dinner when my hubbie and I celebrated our 10 wedding anniversary going out to dinner.